Wide experience in research, teaching, administration, project planning and finance as Reader in Physics at Manchester University for many years provided me with a good start. I managed grants of ~£1M p.a. Led research groups of around 30 academics, research fellows, research students, and other professional and technical support staff at Manchester as part of international collaborations. I had several year long periods when employed or seconded to CERN (Geneva) and DESY (Hamburg) as well as much commuting over 30 years mainly to CERN. My academic qualifications are BSc, PhD, & FInstP. I am joint author of over 100 peer reviewed papers in scientific journals. I was also involved with wider university affairs as a Faculty Tutor, chair of the department's committee responsible for the structure of our undergraduate course, an elected member of the University Senate (and its standing committee), and an elected member of the University Council (the body responsible for the business and finance aspects of the University). I was a member of numerous appointing committees for professors etc. in many Faculties and was involved with teaching and teaching methods and with editing undergraduate textbooks for Wiley. Numerous other interests included all aspects of science, computing, photography, dinghy sailing, bird watching, walking, singing, family history, natural history and communications in many areas. I joined Lancaster and Morecambe U3A in 2004 and was almost immediately elected to the committee as secretary. A year later I was elected chair for 2 years. In parallel I created the role of Groups Coordinator, which was a new concept at L&M U3A. Since then I have had a further 3 year period on the committee. Since 2004 L&M U3A has grown from around 150 to 1350 members. I now coordinate a second Monthly Meeting at Morecambe, lead/coordinate our science and technology group, computer workshop, weekly shorter walks, family history, and jointly lead our computing group and our large geology group. Overall I give talks at a rate of over 1 per month on many aspects of Science, Geology, and Computing. I and the other joint leader of the geology group run a 5/8 day geologically based residential field trip with 30-50 participants each year. I lead at least 25 walks a year. At various times I have managed our IT-equipment, diary and newsletter. My involvement with Networks started almost as soon as I joined U3A with developing a new one and becoming its Contact. This role morphed into my appointment as an EDC / Regional Volunteer and I was the secretary of the steering group that set up a regional structure in the NW. I was a founder member an officer of the NW Region Executive Committee and edited the first 18 editions of NW U3A News and set up and ran our website. My interest and experience pre U3A with budgeting and financial matters together with my experience within my U3A and with Networks and the NW Regional Executive Committee meant that I had an appropriate background to being a Trustee of a national educational Charity such as the Third Age Trust. I was co-opted as the Regional Trustee for the NW early in 2010 and elected in September 2010. In my first year and a half on the NEC, I served on the Standing Committee on Education, and on the Budget and Finance Committee. Since 2011 I have usually Chaired the Finance Committee. I have been involved with Governance matters as well as ad hoc groups on the business aspects of Third Age Matters and the Beacon system. I was elected Treasurer of the Trust in September 2012 and the Trust finances are in a healthy state. There have been many changes, some of which have saved money without noticeable degradation of the services offered to U3As. At all times I have worked to enhance the volunteer ethos of the U3A movement and facilitate the work of volunteers. (e) work toward a more efficient governance structure so that the Trust can serve the movement and its volunteers in an efficient manner. We cannot know how challenging the achievement of these aims will be as the Trust is not immune to potentially severe pressures beyond our control. We must avoid expenditure on any matters that the membership do not demand. Currently our reserves are stable at 6 months expenditure. I will continue to monitor risks to our finances and the movement more generally. We must grow our membership because of the great value membership brings to individuals. There are enormous variations of U3A take-up across the UK that owe more to historical accident than to socio-economic factors. I am convinced that, despite the increase in average age of retirement, we could and should increase our membership over the next few years at a higher rate than at present. I am delighted that the Trust has moved strongly toward supporting and increasing the influence of our volunteers who are essential. The Trust must at all times keep in sympathy with the needs and wishes of the movement. To achieve growth the Trust needs to be pro-active in supporting both existing U3As and facilitating new ones. In particular it must facilitate, in every way possible the learning provision of our 25,000+ interest groups. Without the self-help ethos of the movement it would collapse. This is particularly stark at individual U3A level, but at Trust level it is still true. Network and Regional volunteers provide a lot of resource at a very low cost in monetary terms and a great reward for those who do it and to U3As generally. It is fulfilling and fun so please help by volunteering wherever you are able. A movement with over a third of a million members and around a dozen full time equivalent staff is unusual. However such a ratio is right for U3A. Long may this approach of being a volunteer organisation, through and through, flourish. The U3A movement's membership has outstanding abilities and we need to facilitate their using them for the benefit of themselves and of the whole movement. 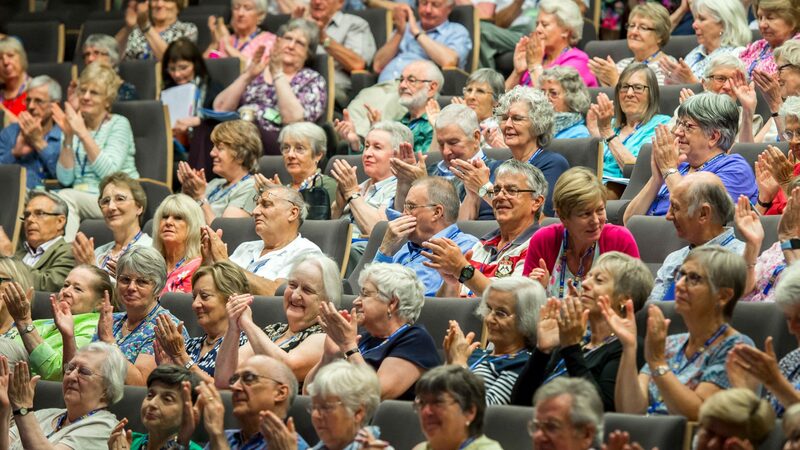 Since volunteers are so critical to U3A, it is most important to maximise the satisfaction our volunteers get from supporting the movement in every way. This must guide the Trust at all times. The governance of the Trust is in need of change to facilitate this by substantial increasing the number of people who are involved at all levels, national, regional and network. This should be a major concern of the Trust in the immediate future. I am always happy to hear of ideas from U3A members on this and any other matter. The recent major changes to the Third Age Trust have lead to a large number of new ways of operating and to many much needed changes in our procedures. These are still mostly incomplete and I am looking forward to making the Trust into a greatly improved organisation if you do re-elect me again this year. I am looking forward to helping the Trust forward in what are certainly going to be exciting times where I hope the Trust and the individual U3As will feel more closely coupled.